i wish i had one of these RIGHT now. In an attempt to make my new fitness goals successful (drop 10 pounds of “sugar” weight), I made a vow at the beginning of this month to lay off baking until Christmas Eve. I failed miserably and lasted 12 days. Hey, it’s better than nothing. In my defense, the ingredient I used for this recipe just couldn’t be resisted, especially since it’s only in the grocery stores once a year. Carpe Diem ladies and gentlemen! Eggnog! Love it or hate it, it’s a Christmas staple. My dad has a deep and personal relationship with the stuff. I’m not partial to it, but it IS super fun to bake with! There isn’t much to say about these holiday treats, except they are so tasty and full of eggnog flavor. They were also demolished in hours. The cake is light and airy with hints of spice. The eggnog frosting was just as sumptuous. 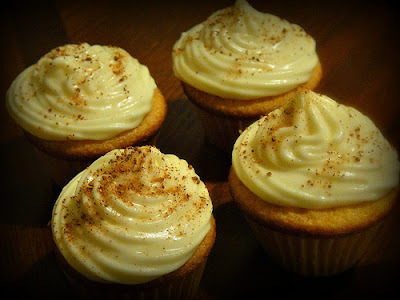 I topped them off with a little ground nutmeg for aesthetics, but a cinnamon stick would look quite fancy too! 2. Mix flour, baking powder, baking soda, and salt into medium sized bowl and set aside. 3. In the bowl of an electric mixer, with a paddle attachment, cream butter and sugar together, about 5 minutes, until light and fluffy. 4. Scrape down the sides of bowl as needed. 5. On low speed add the egg and yolk one at a time. Beat in oil and vanilla until incorporated. 6. Gradually add the flour mixture and egg nog, alternating between the two, beginning and ending with the flour mix. Do not overbeat. 7. Pour batter into cupcake liners and bake for 10-12 minutes (for mini cupcakes). 18-22 cupcakes for regular cupcakes. Cool cupcakes completely before frosting. 1/2 cup unsalted butter at room temp. not melted. With an electric mixer, beat butter and cream cheese together on medium speed until smooth. Gradually beat in powdered sugar until incorporated. Add the vanilla, the nutmeg and the tablespoons of eggnog. Add rum if desired. Beat on medium speed until smooth. Pipe onto cupcakes and garnish with ground nutmeg or a cinnamon stick! This last pic stinks. But I wanted you to see all the little guys together! 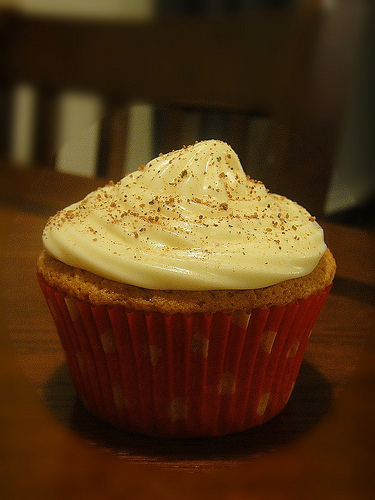 OMGGGGG I just made an eggnog cupcake with buttercream icing! Seriously the besttttt cupcake I have ever had! I will have to try this recipe too! I loveeee anything with cream cheese!